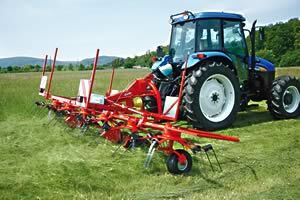 Kuhn has extended the rotary tedder options for smaller operators for the 2010 grassland season with the introduction of three value models at the lower end of its Gyrotedder range. The three-point mounted GF 422, GF 502 and GF 642 offer working widths of 4.20m (4 rotors), 5.00m (4 rotors) and 6.40m (6 rotors) respectively, extending a Gyrotedder range that already includes models with working widths from 5.2 up to 17 metres. The new 102 series models all feature Kuhn’s patented Digidrive rotor drive and are equipped with an oblique drive function for operating on headlands or for distributing grass upwards on slopes. All models are equipped with balloon tyres to ensure good load-bearing capacity and good quality tedding and the rotors each have six tine arms fitted with robust 4-coil tines. The GF 642 is also equipped as standard with a lateral stabiliser, for perfectly controlled work on slopes and bumpy ground. A standard GF 422 Gyrotedder starts at £4,885, the GF 502 is £5,609 and the GF 642 has a basic price of £8,600.